With a grinder or electric spice mill finely grind liquorice. Peel the tangerine s segments, get rid of the white skin and cut the pulp into pieces. Chop the shallots and wilt in a saucepan with a little oil, add rice and toast a couple of minutes while stirring. Gradually pour the boiling broth and keep on stirring, until the rice is cooked and the broth dried. About one minute before the rice is cooked, add the orange juice and the tangerine pulp and stir. 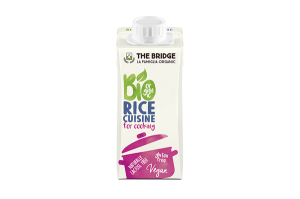 Switch the flame off and wisk the rice with Bio Rice Cuisine, adding a tablespoon of lemon juice and a little bit of its grated rind. Sprinkle the liquorice powder directly on the serving plates, decorating with orange peel.